If we use pop culture as the barometer for women’s workplace fashion, the 70s is defined by Christina Hendricks’ pencil skirt and cinched waist in Mad Men, the 80s was all about Melanie Griffith’s power suits and shoulder pads in Working Girl while in the 90s, Calista Flockhart’s Ally McBeal wore short skirts much to the shock of Boston’s fictional law fraternity. What then, does women’s workplace fashion look like in 2016? First we have to consider that this decade’s workplace is synonymous with technology companies, start-ups and entrepreneurs with their cool offices, flat hierarchy and flexible working arrangements. It’s a world where office dress codes are antiquated. Therefore, the fashion choice for today’s bosses, employees, billionaires and technopreneuers is the jeans and hoodie combo made popular by Mark Zuckerberg and Silicon Valley’s cool geeks. It is an outfit that extends the uniform of teenagers and youths into adulthood and scorns at the idea that people have to suit up to be taken seriously. While jeans and hoodie are technically gender neutral outfits, it is hardly the choice outfit for the women CEOs. Marissa Mayer and Sheryl Sandberg, some of the highest ranking and well known faces in technology wear suits and ‘professional’ attire when they give press conferences or speeches. What then, do women wear when their office has no dress codes? While technology companies have no reverence for dress codes, government agencies, bank, consulting companies and law firms are the opposite. These are places where an employee needs to decipher dress codes like business professional, business casual or business formal. Women, especially, have to adhere to a longer list of both written policies like wearing closed toe shoes and unwritten policies like no sequins or visible bra straps. 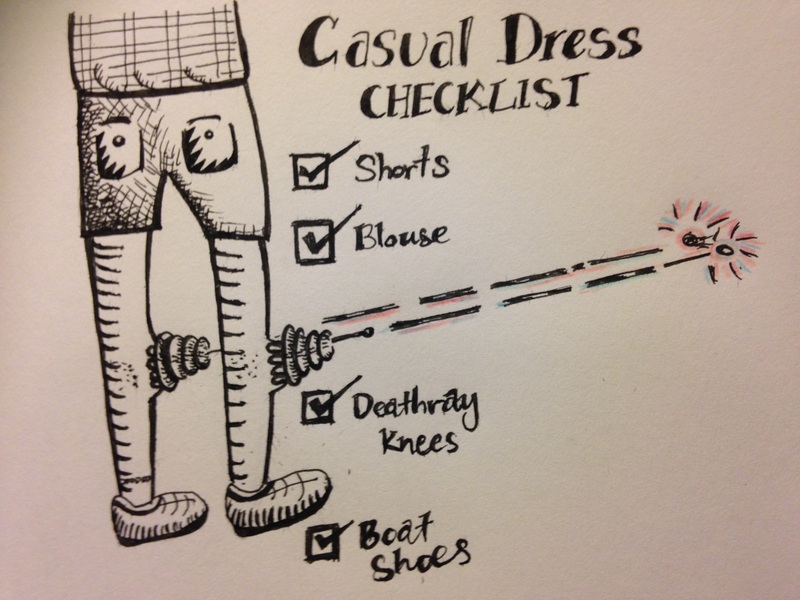 It is no wonder that when these companies jump on the casual Fridays bandwagon, it still comes with a long list of dos and don’ts. Employees are encouraged to show their personal styles, but not too much! Sure, wear a cool brown leather jacket but make sure it doesn’t have a Metallica logo! Be comfortable, but don’t wear flip flops! For example, when JP Morgan relaxed its dress code for non-client facing employees, it cautioned people against interpreting the new dress code as “weekend casual”. This means no athletic shoes, flip flops, sweatpants, leggings, yoga pants, hats, hoods, halter tops, or anything else “distracting, tight, revealing or exceptionally loose or low-cut”. Even jeans, the universal sign of casual-ness is not considered business casual by JP Morgan’s standards. She makes a good point. The truth is, casual dress codes and even the no dress code policy gives employees the impression that they are in control but in reality, they still need to conform to the company and societal expectations. One of the Big 4 global accounting firms, PwC officially scrapped its ‘modern professional’ dress code this June and asked its employees to do just that: use their own judgement on what is an acceptable outfit. That might have dashed some hopes for employees who were hoping to rock up in their trackpants. It is obvious that for many women, dress codes are still a minefield and a source of battle stories. Perhaps we should all dress for work based on one simple rule: if it needs ironing, don’t wear it. Great piece – I’ve been thinking about workplace attire a lot recently. I recently wrote a (yet to be published) piece for a US feminist website about one of my male colleagues telling my female colleague to up her make-up game. There are so many double standards it’s hard to know what’s okay and what isn’t. I’m sure I get it wrong, but who knows how to get it right? I guess you’re right – all I know is that I definitely don’t iron. 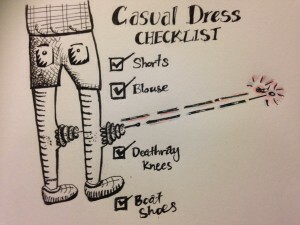 This entry was posted in Featured, Feminism and tagged dress codes, work, work wear. Bookmark the permalink.